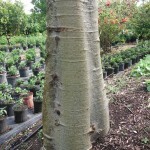 Baobab Tree (Adansonia digitata) - Richard Lyons Nursery, Inc.
As you know, we are surrounded by weird things. In your case, at this very moment the closest weird thing is probably your neighbor’s teenage son, who thinks he is the next Justin Bieber, but more closely resembles an offkey cyclops. 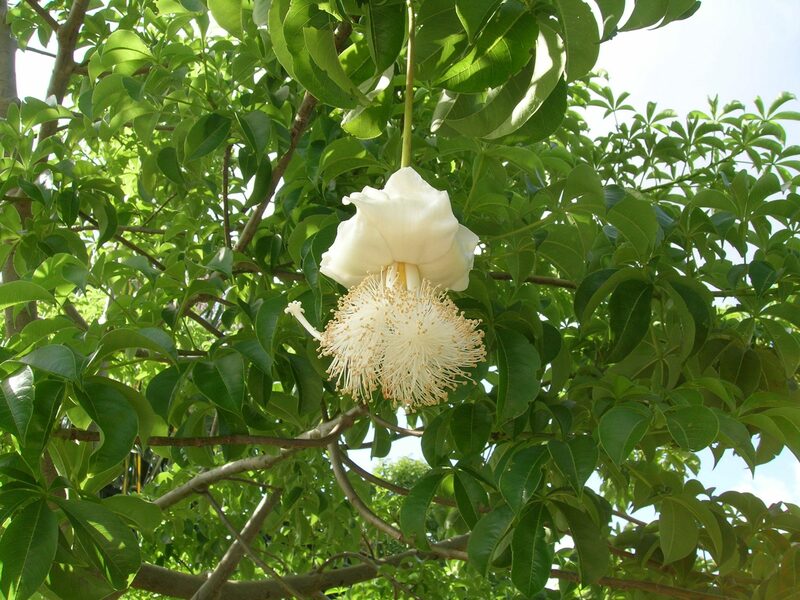 In the plant world, one of the weirder things is the Baobab tree, but, unlike your neighbor’s kid, the Baobab has a future, quite possibly in your yard. 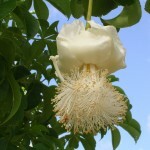 Following centuries of confusion and debate, there is now general agreement among botanists that the genus Adansonia comprises eight species which range over some 10,000 miles from western Africa to Madagascar to the Arabian Peninsula to northwestern Australia (where they are known as Boabs). Continental drift following the breakup of Gondwana used to be credited for the broad range of Adansonia, but a more recent theory holds that the buoyant seedpods distributed Baobabs to western Australia and eastern Africa by sea from Madagascar. What is common to all the species is their trunk girth, an adaptation to arid environments that allows the plant to store large quantities of water. Baobabs have long served as living reservoirs for humans, particularly nomadic tribes. Revered across their range, Baobabs have a number of valuable uses aside from their role as a source of water. Their leaves are used to make soup or are eaten as a spinach-like or asparagus-like vegetable or dry condiment. The white pulp found inside seed pods makes a pleasant drink when mixed with water, and the same pulp is used to treat malaria. The seeds themselves are edible in several forms. 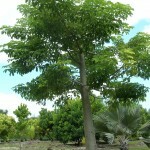 The bark of the tree can be pounded into fiber to make clothing, fishing nets and rope. 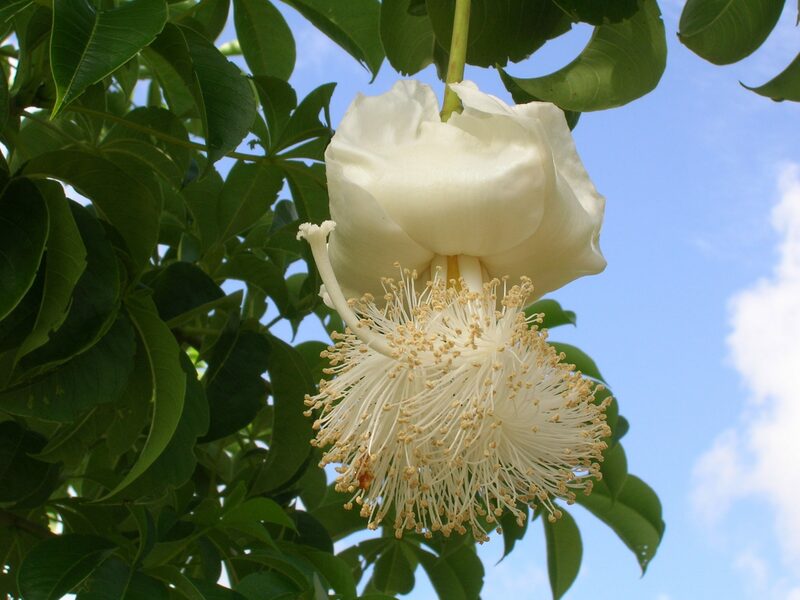 And in addition to their utilitarian assets, the Adansonia species produce small to large, sweet-smelling flowers. 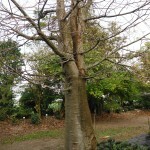 The trees have no growth rings, but at least by reputation they are extremely long-lived. 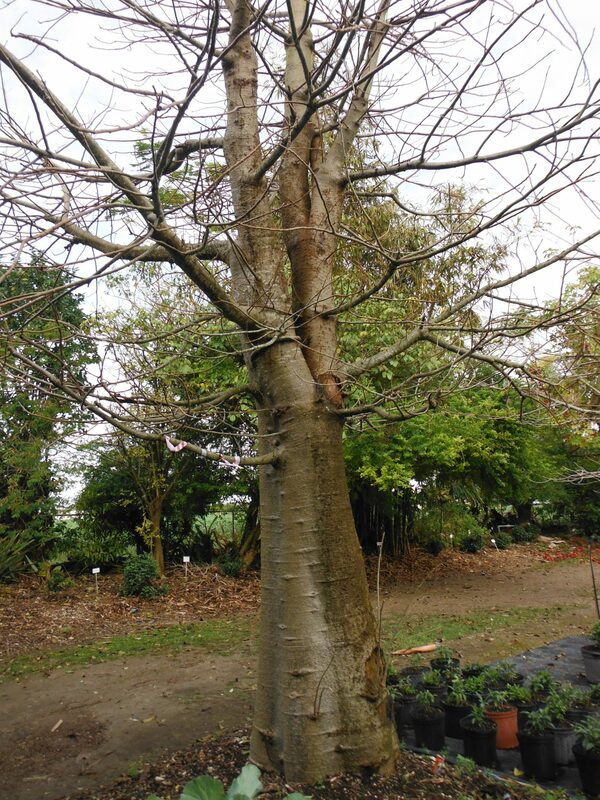 One of the qualities that aids longevity is the ability to regrow bark when it is damaged, either through accidental injury or by being intentionally stripped for the fiber. Some older specimens have developed such large, hollow trunks that they have been used as prisons, or, more accurately, lockups, for criminals being transported to more traditional accommodations. 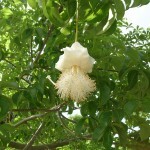 The Baobab is not a succulent. Young plants in particular do not respond well to drought. Rather, the genus is simply highly adapted to areas of low rainfall. 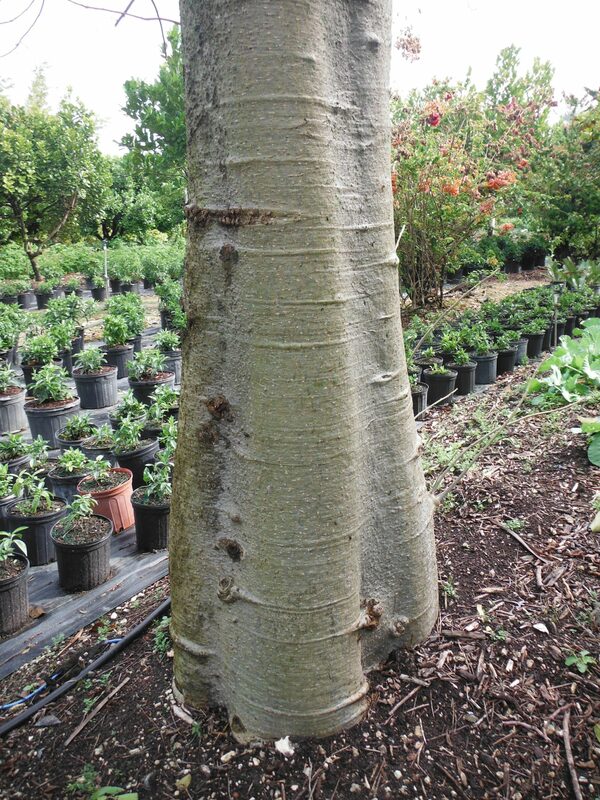 That fact helps explain why Adansonia is quite capable of handling the moist climate of southern Florida if planted on a well-drained site. 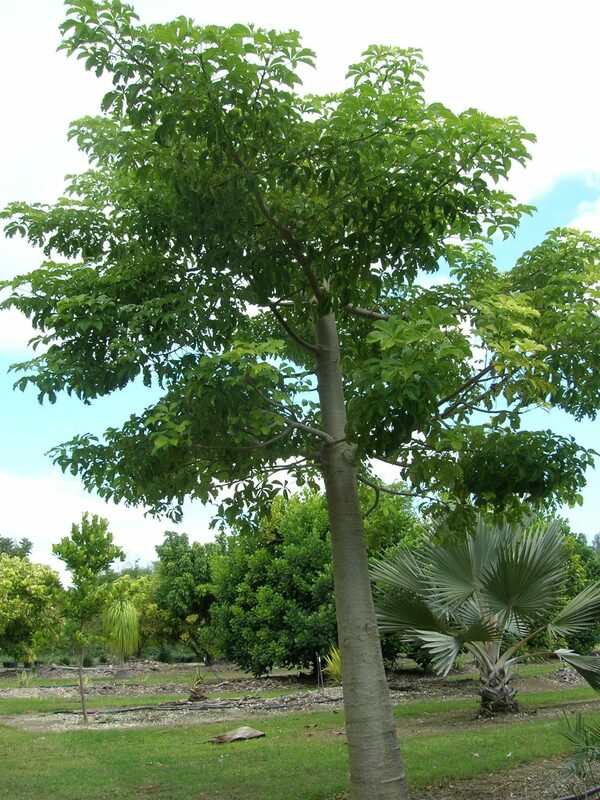 Adansonia digitata is a proven quality performer in the landscape of southern Florida, and its slow growth rate will not put this interesting tree out of scale to residential properties. Richard Lyons’ Nursery has it available in 15-gal. containers, at about 12 ft. in height. And it might well help you forget about the kid next door.